Single Bubbler is attached on 20" side arm. Polyester Powder Coated steel pipe base. 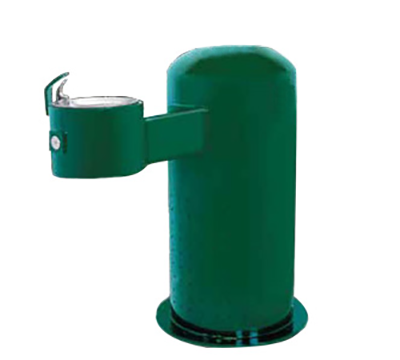 Standard Color: Woodland Green, Optional Colors Available. Delivers 8.0 GPH of Chilled Water. Use 35AC-00022 embedded mounting plate for leveling and additional security. 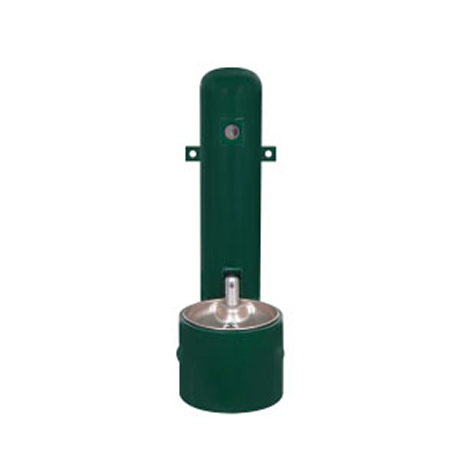 18 inch diameter body with 22-1/2 inch base plate, 40 inches high, Single Bubbler is on arm protuding 20 inches from body of the drinking fountain. Bubbler height is 36 inches. Limited Warranty: This warranty is exclusive and expressly made in lieu of all other warranties of quality, whether written, oral or implied (including any warranty of merchantability and/or fitness for a particular purpose), arising by law or otherwise, and no other warranty is authorized to be made, except where any such limitation is expressly prohibited by law. Warranty of products of another manufacturer sold by Manufacturer is limited to the warranty extended to Manufacturer by such manufacturer or provider. This written warranty shall not be extended, altered or varied, except by a written instrument signed by Manufacturer and Buyer. No representations were made or relied upon with respect to the products or the terms of this written warranty. Manufacturer extends a limited warranty to the Buyer that products of its own manufacture shall be free of defects in material and workmanship for a period of one (1) year after the date of shipment from Manufacturer. Under this warranty, Manufacturer will, in its sole discretion, upon receipt and verification of a written claim, either 1) repair the product, 2) replace the product or any part therein with a Manufacturers’ product of similar type and size, or 3) refund to the Buyer the wholesale price of the product. All of Buyer's claims must be in writing and delivered to Manufacturer, at Manufacturers’ address, within ten (10) days after each respective delivery and before the products are put into process or in any way changed from their original condition. If Manufacturer elects to refund the wholesale price to the Buyer, Manufacturer shall have no further obligation to Buyer, any wholesale consumer, or any contractor with respect to such product. Goods proven to be defective will be replaced after proper inspection, but no claims for damage incurred or for work done thereon will be allowed. Replacements, when supplied, will be shipped at no cost to the consumer. No claim shall be made for proximate damages of a different amount, nor may any recovery be had for incidental, special, contingent, consequential, exemplary, or punitive damages; costs of delay; costs of third parties arising from any source; or lost profits arising out of, or related to, any product sold by Manufacturer, even if Manufacturer has been advised of the possibility thereof and regardless of whether the claim is made in contract, tort, or other theory or cause of action. Under no circumstance will Manufacturer be liable for any labor or other expenses not specifically stated above. All controversies arising out of or relating to the providing of products by Stern-Williams shall be settled by arbitration in the County of Johnson, State of Kansas in accordance with the Commercial Arbitration Rules and Mediation Procedures of the American Arbitration Association.